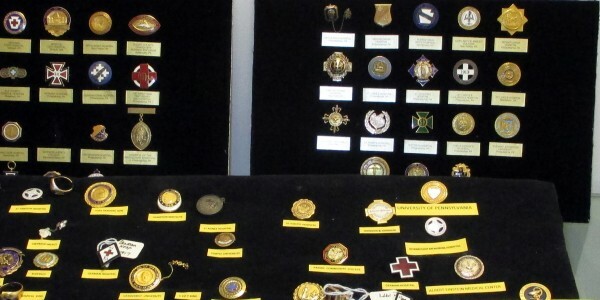 The Museum of Nursing History has an extensive collection of nursing pins. Each school of nursing had a unique pin as well as a cap. The capping ceremony frequently occurred following completion of the probation period. Some schools had a method to distinguish completion of “nurse’s training” by adding a stripe, pin or changing the style of the school’s cap. The school pin commonly would be received as part of the graduation ceremony. The new nurse would enter her profession proudly wearing a white uniform, cap and pin ready to devote her acquired skills to the betterment of those committed to his/her care. As with many professions the traditions become “less prominent” over time. The entire collection can be viewed when visiting the Museum during hours when La Salle University is open.